How much does it cost to travel to Tromso? How much money will you need in Tromso? kr988 ($116) is the average daily price for traveling in Tromso. The average price of food for one day is kr345 ($40). The average price of a hotel for a couple is kr962 ($113). Additional pricing is in the table below. These average travel prices have been collected from other travelers to help you plan your own travel budget. The city of Tromso, in northern Norway, is named after the island of Tromsoya, on which it stands. Tromso is located 350 kilometers north of the Arctic Circle and is the largest city in Northern Norway. From September to March many people come to Tromso to see the northern lights. From 20 May to 20 July the midnight sun makes it possible to do as the locals and participate in various activities around the clock. In general, Tromso has a mild climate for such a northerly destination because of its seaside location and the warming effect of the Gulf stream. Tromso is ideal for seeing the northern lights and has a modern mix of outdoor activities, a vibrant nightlife, and places to eat local food. Tromso has several churches and old homes that are interesting and well worth visiting. There is also museum and the northernmost botanical garden in Norway, but the main reason to visit Tromso are the spectacular natural vistas and phenomenon's that northern Norway is famous for. The Northern Lights. This beautiful display is one of the main reasons that many people make the journey this far north, and Tromso is a great location for seeing this natural phenomenon. It is often said that the northern parts of Norway is the best places in the world to see the northern lights, because few other countries where the lights can be seen can rival the vast selection of activities, tours, cruises, restaurants and hotels which all play an important part in this arctic experience. The midnight sun. The day that never ends, another phenomenon and popular reason for many tourists to visit Tromso. The earth is rotating at a tilted axis relative to the sun, and during the summer months the North Pole is angled towards our star. That's why, for several weeks, the sun never sets above the Arctic Circle. Like a prolonged sunset and sunrise all at once, the midnight sun colors heaven and earth in a reddish yellow light. The city center is the ninth-largest urban area in Norway, with a population of about 60,000. The city is home to the world's northernmost university and also houses the northernmost botanical garden and planetarium. It is the main neighborhood of interest to tourists. The compact city center has the biggest concentration of historic wooden houses north of Trondheim, and they co-exist with modern architecture. The houses date from 1789 to 1904, when building wooden houses was banned in the city center, as in several other Norwegian cities. The oldest house in Tromso is Skansen, built in 1789 on the remains of a 13th-century turf rampart. Kroken is located along the Tromso strait and is across the strait from the city center. It is a large residential area in the city of Tromso. It has two schools, Kroken Church, the Ishavsbyen FK association football club, and the Krokensenteret shopping mall, where Norway's largest Coop Prix is located. Tromsdalen (English: Troms valley) is connected to the island of Tromsoya by the Tromso Bridge. The Tromsdalselva river flows through the valley. Popular attractions in Tromsdalen are the Arctic Cathedral and the Fjellheisen aerial tramway to the top of a nearby fell; the tramway ends at an elevation of 420 meters (1,380 ft) where the view is stunning. The mountain Tromsdalstinden is located at the eastern end of Tromsdalen and reaches an elevation of 1,238 meters (4,062 ft). The climb to the top of this mountain is very popular with the Tromso residents, since mountain climbing equipment is not usually needed. Tromso has many activities on offer, from an aquarium and several quality museums to the world's northernmost botanical garden. The city is also a popular place to observe the majestic phenomenon of the northern lights. Tromso also has several festivals and celebrations to enjoy. Both the Tromso International Film Festival and Nordlysfestivalen (the Aurora Borealis Festival), a classical music festival, are arranged in January. The end of that month is marked by the Day of the Sun (Soldagen), when the sun finally appears above the horizon after the Polar Night, which is celebrated, mainly by children. The International Day of the Sami People is celebrated at the University of Tromso and the city hall on 6 February every year. Tromso's Latin American Festival, No Siesta Fiesta, is held at the end of February. It started in 2007 and showcases the best of Latin America in Northern Norway with film, dance, music, art, seminars, debates, markets, and a street Samba parade. Every autumn the Insomnia Festival for electronic music is hosted. It is one of the largest and most important festivals for electronic music and techno culture in Norway. The Bukta Tromso Open Air Festival, held in June and July, is a popular music festival. The Bukta festival is mainly a rock festival, but also features other kinds of modern music. The festival takes place in Telegrafbukta, a park on the south-western part of the Tromsoya island. Other popular cultural summer events among the population of Tromso is the Karlsoy festival and the Riddu Riddu festival, both held in the region surrounding the city. Aunegarden is a cafe and bakery dating from 1830. They've been cooking food for over 130 years, and today serving the food they themselves call the taste of Northern Norway. Vollan Gjestestue, a cafe and restaurant, that prides themselves on serving great local food all made from scratch. There are many daily domestic flights to Tromso Airport Langnes. Most international flights to Tromso require changing planes at Oslo Airport. There is no train service to Tromso. You can take the train from Oslo, Bergen and Trondheim to Fauske, where you must transfer to a long-distance bus to Tromso via Narvik. Long-distance buses connect Tromso with Alta, Narvik, Bodo and Fauske all year round. 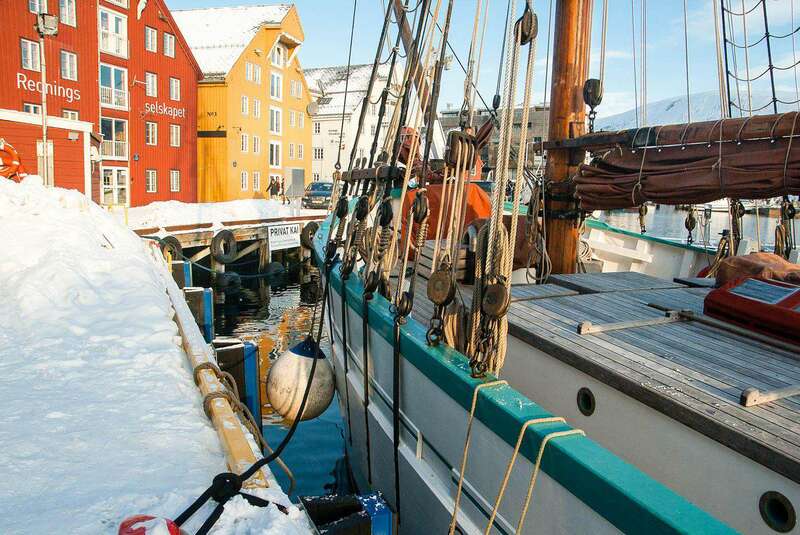 If you're going to the Lofoten Islands, transfer in Narvik. A 1600-kilometer long highway, which remains open all year, connects Tromso with Oslo. Driving time is approximately 30 hours from Oslo. For getting around once you're there, Tromso has an extensive local bus and ferry network.